Taylor Swift Sends Lucky Fan Generous Gifts And More! – Find Out Here! However, that’s not all! Taylor also gave Rebekah a check for $1989 to go towards paying off her student loans. Be sure to check out Rebekah opening the awesome gift by watching the video below! Miley Cyrus Showing It Off In ‘V’ Magazine Polaroids! It seems that Taylor Swift’s album “1989” has really brought back the old polaroid look and feel. New pictures from Miley Cyrus’ photoshoot for V Magazine have emerged and they are everything you would expect from the 22 year old singer. For her first time in V Magazine, Miley is baring it all. Wearing a red wig and then nothing much at all, she truly has nothing left to hide! Miley’s crazy spunky attitude shines through each and every photo and even when you can see everything she has going on, she still wears an adorable innocent enough smile! Check out all of the photos below (all censored) and let us know what you think about the racy photoshoot! 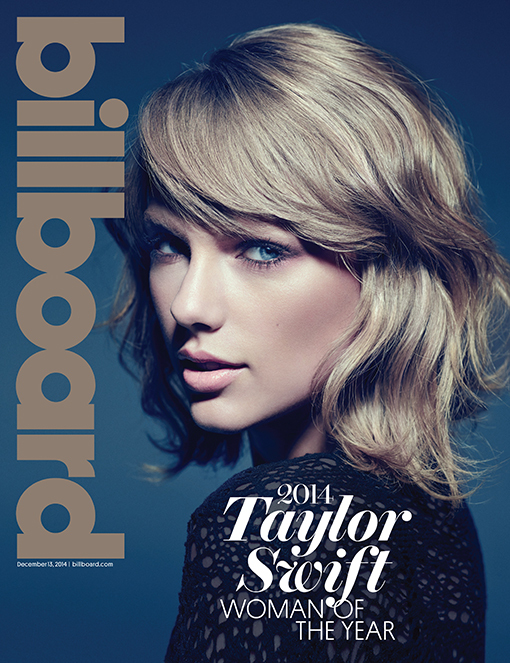 Taylor Swift Is On The Cover Of ‘Billboard’s Woman Of The Year’ Issue! – See It Here! This year, Taylor Swift has worked extremely hard on expanding her music career. While she is mostly known for her country style tunes, Taylor decided to take a different approach to her music in her new and latest album 1989. It sure proved to be the right move for her. With two singles – “Shake It Off” and “Blank Space” – already being on the number one spot on Billboard’s Top 100 Chart, Taylor is now covering Billboard’s Woman Of The Year issue where Taylor is the 2014 Woman Of The Year! Be sure to check out her cover in the photo above and let us know what you think by commenting! Be sure to also check out her interview with them magazine by clicking here. Taylor Swift Performs “Blank Spaces” On ‘The Voice’ – Watch It Here! Taylor Swift made her debut performance of her latest hit single “Blank Spaces” from her new album 1989 at the 2014 American Music Awards. Just a few days after, Taylor appeared on NBC’s The Voice where she performed her single once again. Earlier this season, Taylor made an appearance on the show as a special mentor for the knockout round. Be sure to check out Taylor’s performance of “Blank Spaces” on The Voice by watching the video below! Taylor Swift Is First Woman To Replace Herself At Number 1 Spot On Billboard’s Top 100! Taylor Swift decided to go with a different direction in her music and with her latest album 1989. The switch from country to pop proved to be beneficial to Taylor. With over one million sales of her new album and countless covers of various magazines, Taylor is breaking yet another record. Taylor is the first woman in over 50 years of history to replace herself on the number spot of Billboard’s Top 100. For four consecutive weeks, Taylor’s single “Shake It Off” has been sitting on top as number one. Now, her new and latest single “Blank Spaces” has taken over. In addition, “Blank Spaces” jumped from number thirteen to number one. So far this year, Taylor is the only music artists to have secured two number one hits. With only a couple more weeks left in the year, who knows what could happen next. Taylor Swift Is On The Cover Of ‘Time’ Magazine – See It Here! Taylor Swift has become one of the biggest stars this year. Her new and latest album 1989 has already solder over one million copies since its release and her new direction music is bringing nothing but success for her. Be sure to check out Taylor’s Time Magazine cover in the photo above and let us know what you think by commenting! Taylor Swift Is The Cover Of ‘Wonderful’ Magazine – See It Here! Taylor Swift is looking pristine on the cover of Wonderland magazine’s November/December 2014 issue. The magazine is set to be available on newsstands this Thursday (November 13)! Be sure to check out her cover for the magazine in the photo above and let us know what you think by commenting!